Social media (SoMe) has transformed communication among health care professionals by enabling rapid and global information exchange. Yet, the novelty of SoMe and concerns about potential risks continue to be barriers to adoption. To encourage appropriate professional use of SoMe by physicians in concordance with best practices and to update practical guidelines for effective and professional use of these communication technologies. 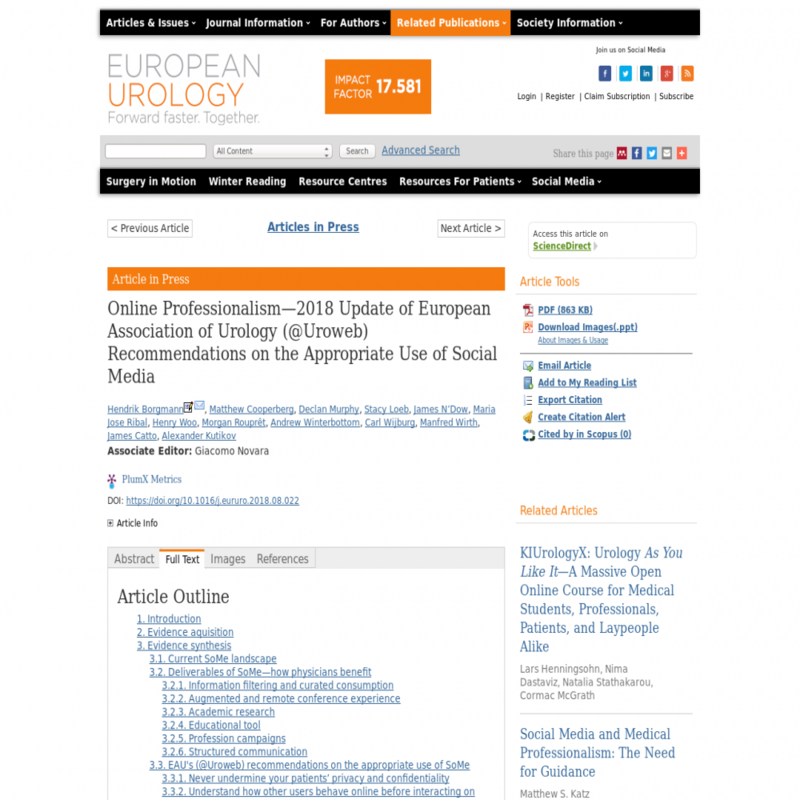 The European Association of Urology (EAU; @Uroweb) brought together a committee of SoMe stakeholders in the urology field. PubMed and the grey literature were searched to identify SoMe position papers by other medical societies and organizations. Updated practical guidelines for effective and professional use of SoMe communication technologies. A core of 10 practical recommendations for the responsible, ethical, and constructive use of SoMe communication technologies was articulated. The guidelines are limited by their inherent subjective nature and lack of robust evidence supporting their utility. SoMe is reshaping the way the urological care providers communicate; however, appropriate engagement requires courtesy, professionalism, and honesty. Adherence to guidelines will help users harness the benefits of SoMe in a safe and effective manner. Social media has transformed communication among health care professionals. This narrative review article provides an update of practical guidelines for effective and professional use of these communication technologies.